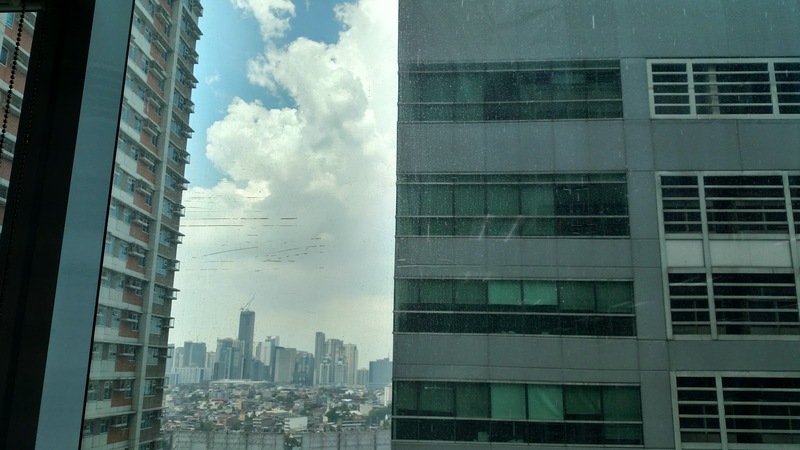 Agile Dispatches from the Field: Magandang araw from Manila! Aki si mabuti! As a new ex-pat, I want to quickly learn the ways of my new city/country so that I can make best use of my time and smoothly assimilate. Acceptance criteria: Watch and learn, ask questions, take notes, explore new areas, and expand my boundaries. After ~36 hours of travel time--3 airports and many different faces and languages--I arrived in Manila about midnight local time. The customs lines were long but moved fairly smoothly and quickly. Baggage took the longest, but what else is new? I did get both my bags and they were intact so I have no complaints. It was interesting to watch all the other people waiting for their bags and to see what they were retrieving. Some people didn't have luggage as I recognize it; small bags wrapped with so much tape they were just blobs--it made me wonder why they didn't carry them on the plane. And there were backpacks and duffles with massive amounts of tape wrapped around them as well. I don't know if the airline wrapped them or if it's de rigueur to use tape for security. Unfortunately, I was too tired to remember to get my phone out to snap photos. There were so many Balikbayang boxes it was a little crazy. Balikbayong boxes are filled with the things that Filipinos are sending to their friends and family in the Philippines or bringing home from their overseas travel. These can include anything and everything--food, clothing, gifts, etc. Generally, there is a price per box based on size and then you jam whatever you can fit into it; but these are usually sent by cargo ship. I don't know if it works the same via airline. I saw one group collecting several large boxes so it's possible, because otherwise they were paying the equivilent of upwards of $200usd a box and that *is* crazy. The men around me kept asking didn't I want a cart for my luggage as I began collecting it, but I told them no thank you and then proceeded to attach the awesome baggage strap my husband found for me and casually walked out with two large suitcases (weighing 50 pounds each), and a rolling carry on bag with another bag strapped to it. I definitely got stares, but I like to think they were impressed. The company arranged a car and driver to get me from the airport to my hotel and that ride and check-in at the hotel were smooth as well. The night life in metro Manila is alive and well. There were many people and cars out and about even at 1 o'clock in the morning. The hotel is very nice and the 'room' includes a small kitchen, in addition to the bedroom, bath and small living area. 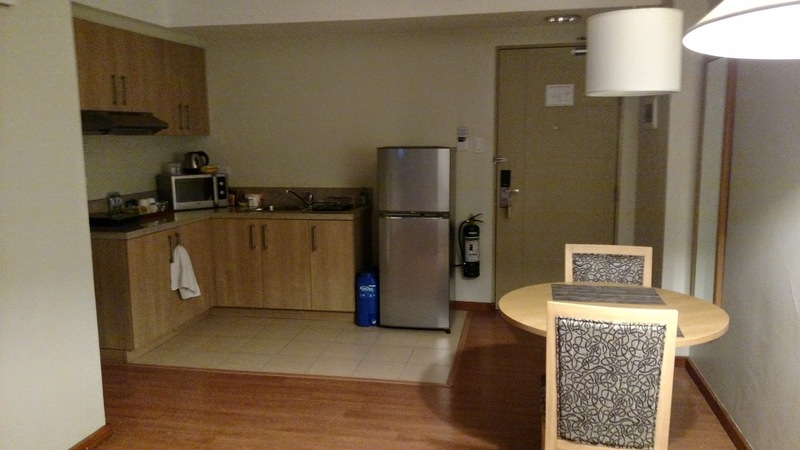 There is a microwave and small refrigerator and a single burner hot plate type appliance. My first thought was, "This is going be interesting." But it was late, and I was going to work in a few hours, so I just let it go (let it goooo) and went to sleep. I had a guide my first day, a co-worker who is moving to Manila from India and is staying at the same hotel with his family while finding long term accomodation. He was instrumental in my first lessons--taxis and the ways of the city; I learned by observing. But first up breakfast, day one. This meal is included with my hotel stay; as I just arrived and had no food in my room but needed sustenance to help fight the jet lag I went to check it out. Also, I was meeting my co-worker there. The breakfast buffet in Manila is an amalgamation of what I think of as breakfast, lunch and dinner. It includes things I recognize as breakfast foods--eggs, ham, toast and jam, fresh fruit and juices, as well as oatmeal with several toppings and an omelette bar--but also things I would look for at lunch or dinner time. 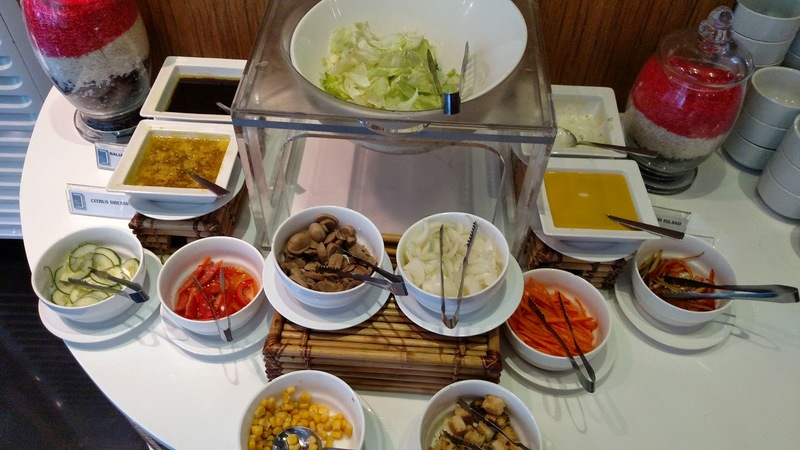 There is a full salad bar with iceberg lettuce and lots of vegetables; plain noodles and rice, spaghetti, and sausages and some other pork entree I don't yet know and lots of different breads. So very interesting. But the coffee is very good and I don't care what other people want to eat and when. Mangia, bon apetite and tayo'y magiskain to all! After breakfast my co-worker and I set out for the company office to check me in and get a laptop. 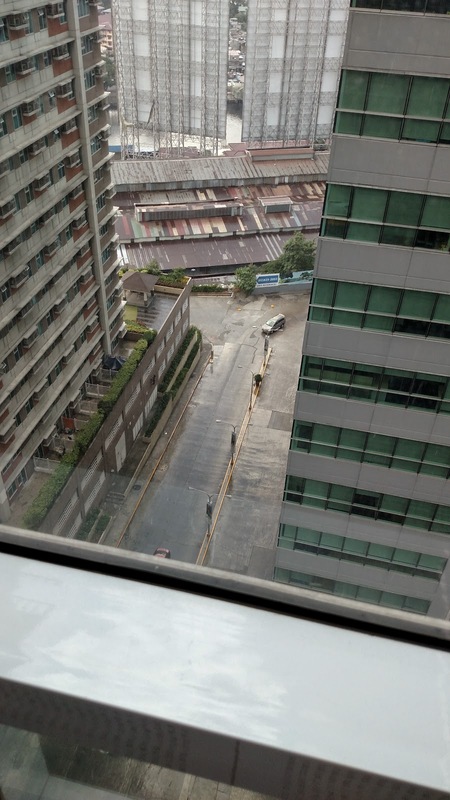 We walked through Makati City and he explained the best place to live if I am looking for a large ex-pat community and the care I should take while out and about--e.g. only go to a bank with an ATM inside and/or overseen by a guard and don't walk the pedestrian underpasses at night alone. We caught a taxi to the building where we actually work (the company is in the process of building out space in a new office and in the meantime we are in the offices of a contractor vendor) and I got to see first hand and ride in the traffic I had heard about. Even as late as 10 in the morning the traffic is full tilt boogie... well, it is pretty much all day long. There really is no concept of 'rush hour'; but you can skip the worst of it if you travel early in the a.m. Buses, cars, taxis, jeepneys and motorcycles, vespas, tricycles and more. All jockeying for the same space on the road and no one paying the slightest attention to painted lines or signs signifying bus only lanes, etc. At first is seems like massive chaos, with constant honking and beeping, but eventually you start to see that there is an organization to the chaos and a symphony in the noise. But the traffic jams don't end outside the office. There are so many people arriving to work about the same time that there are long queues for the elevators and regardless of posted weight limits and restrictions on the number of people in a car, they will jam as many people as will fit into the elevator. One ride I counted as many as 20 people. The accompanying noise from the elevator cables and winches is not comforting, but we seem to make it up and down just fine. I have a great view from the windows in my area and good desk space. Although I don't have a phone yet I do have a network connection and that is all I really need. I have my kanban board up and running, and Master Chief and Cortana to keep me company. There is a Nescafe coffee machine (learning to love it) which makes not half bad and free lattes right outside the door and if I really need it a Starbucks in the lobby. What more do I need? It's going to be interesting learning all the things that are different here, and to cultivate some additional patience since it seems time is not viewed the same way we think of it in the States. And many of the things I took for granted state side are not the norm here in Manila. 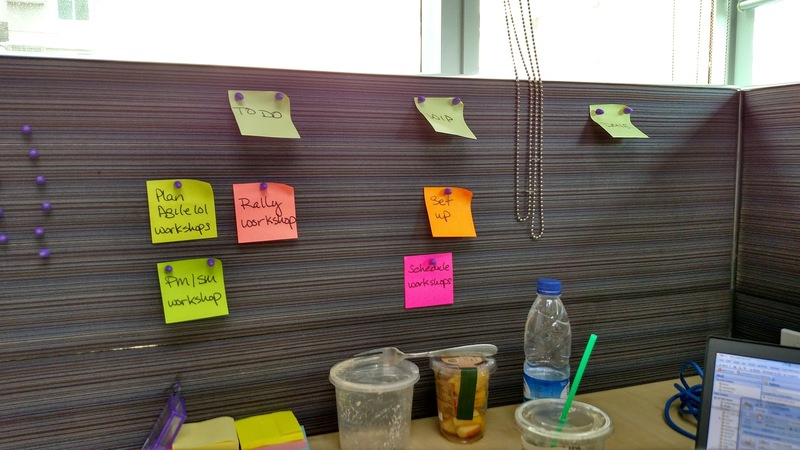 But no matter, I can make just about anything work and my goal is to spread the Agile love. I don't need much beyond my mind, voice, and sense of humor to do that. Wish me suwertehin ka sana! I'll retrospect my first week in the next post and identify whether I met the acceptance criteria for my story.